Welcome back to the daily grind, my friend! How was your mini-vacation? I hope you enjoyed East Tennessee and the mountains of North Carolina. Things are on auto-pilot around here with the World Cup in full swing. Weekends center around soccer-watching. Fortunately, my husband has several friends who enjoy watching it too, with wives and kids who do not. So we've organized get-togethers the last few weekends, which have made the hours of sports on television much more bearable! I am FINALLY ready to show you the project I gave a little teaser about back in early May. (It's both daunting and distant to revisit the intense trauma of the Tennessee floods, two months later...) You may have guessed by now that these little pieces of fabric were pattern pieces for the Pincushion Caddy in Anna Maria Horner's Seams to Me. Maybe you recognize the green and chartreuse pieces from the pincushion I gave you for your birthday! I should warn you and our readers that I may ramble on here. LOTS to say about this project. I fell in love with this little caddy when I first read Seams to Me after I received it as a gift last Christmas. 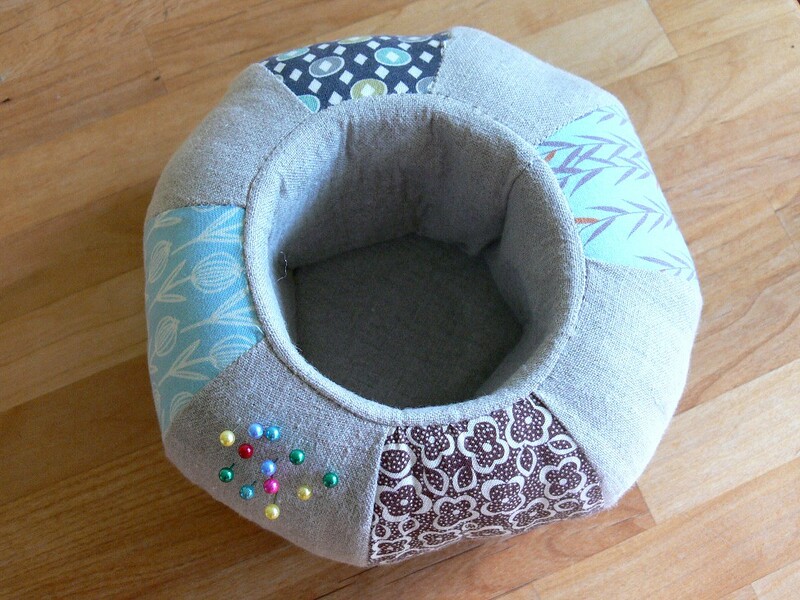 Having dealt with a little tomato pincushion for years, and constantly losing it and my scissors under fabric (and having to convince my cat it is NOT one of her toys and pins are NOT for eating), I was ready for something sturdier, more practical, and more visually appealing. 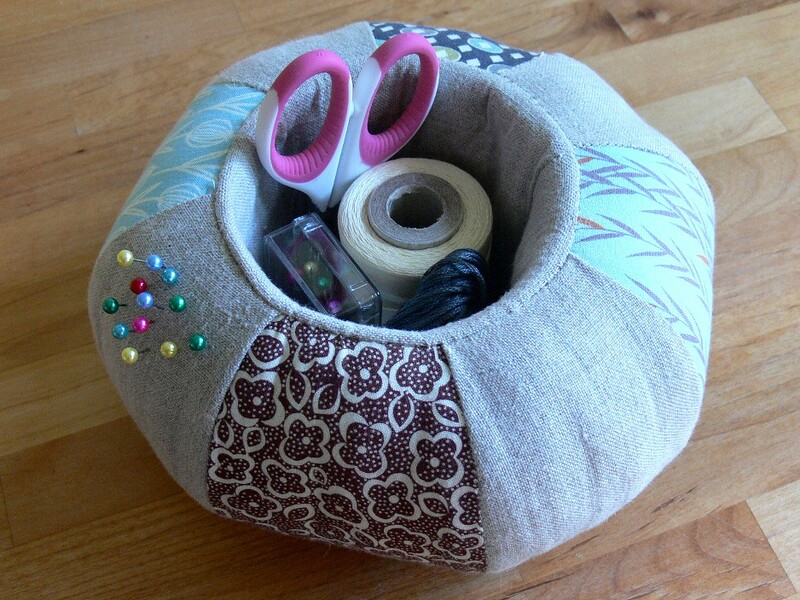 I decided to make a pincushion caddy for myself. Right around that time, I realized your birthday was coming up, as well as my friend Blair's birthday. 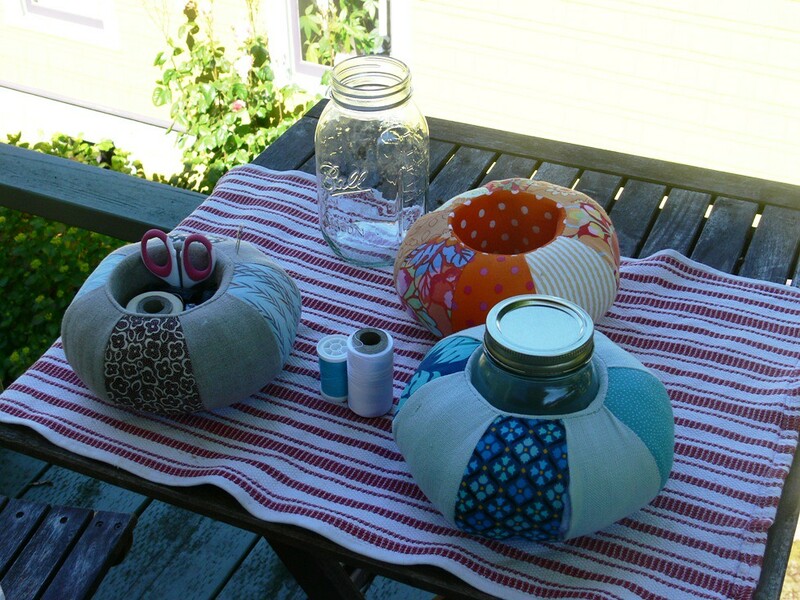 So, I decided to make three pincushion caddies. And, since I was already going to make so many, I figured, might as well make one more... just because. 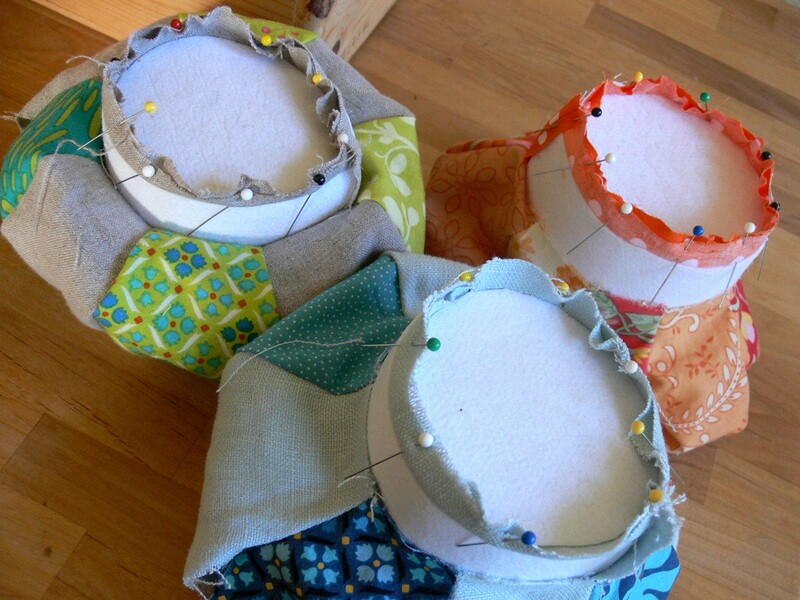 So, FOUR pincushion caddies were cut and prepped, in a variety of coordinated fabrics. I know from our crafty secret santa exchanges that Blair's favorite color is orange and yours is chartreuse. My color themes and fabric choices stemmed from that knowledge. I wanted to included linen as much as possible. 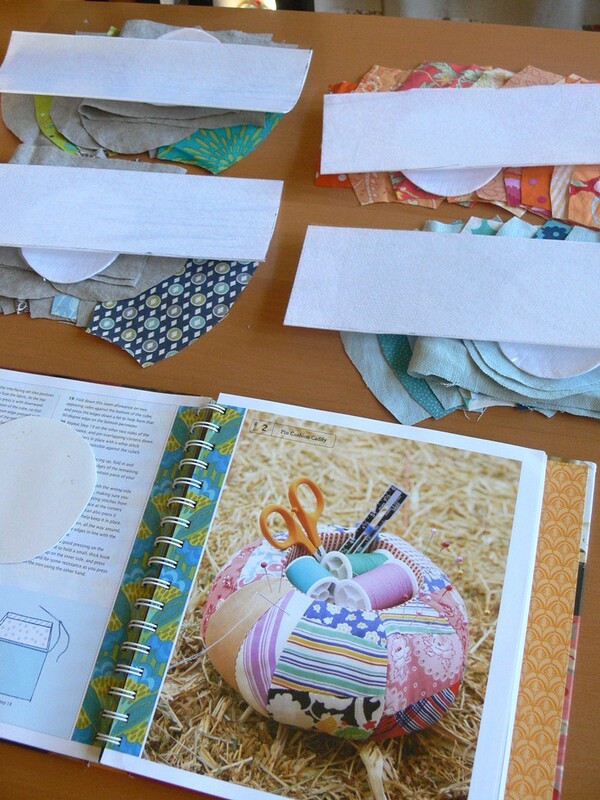 My own caddy uses scraps from blue and brown fat quarters I bought with my mom when she was visiting. I liked the thought of these fabrics reminding me of her whenever I sew. As you know, she is an inspiration in "getting it done". 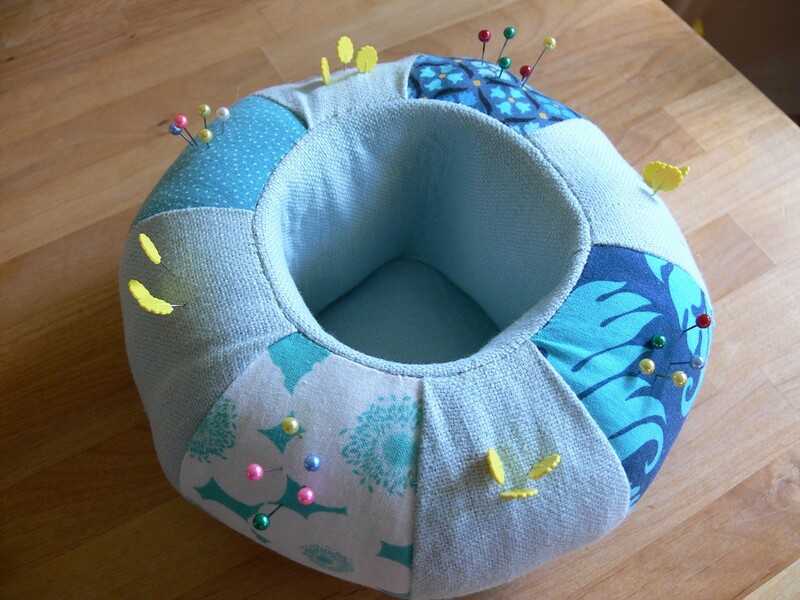 For the fourth pincushion, I used some blue and teal prints that I love, including some Amy Butler, Denyse Schmidt and Kaffe Fasset from a while back. I'll be honest, this project was a pain in the booty. Way more complex than I expected going into it. I do think the result is worth it, but it is also not nearly as polished as I would have liked, especially for a gift. 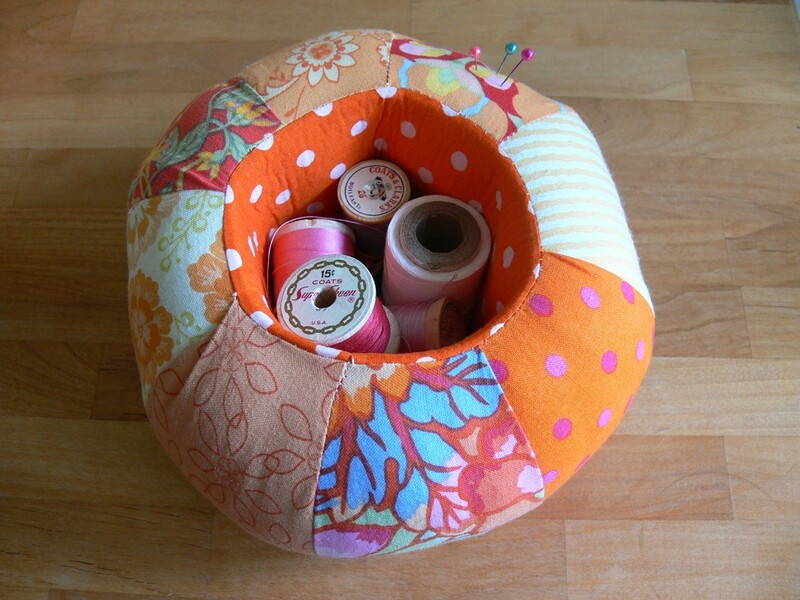 If you are making this pincushion caddy, please cut your pattern pieces EXACTLY right and follow the directions with military discipline. 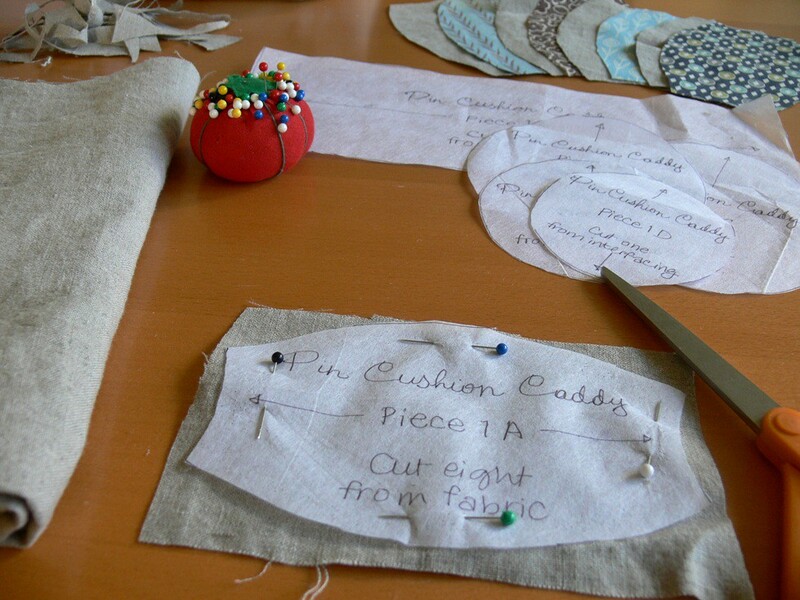 It also helped me to look for pattern reviews in the blogosphere and get some tips prior to diving into it -- for example, to use a container to hold the caddy's shape when stuffing. I screwed up in several parts, and paid for it FOUR TIMES. Another thing you should know -- and Anna Maria Horner does mention that in the instructions -- is that there is a lot more hand sewing than machine sewing in this project. This was actually kind of nice, since it allowed me to slow down a bit and sit down with Ben while he played with Tinker Toys or puzzles. 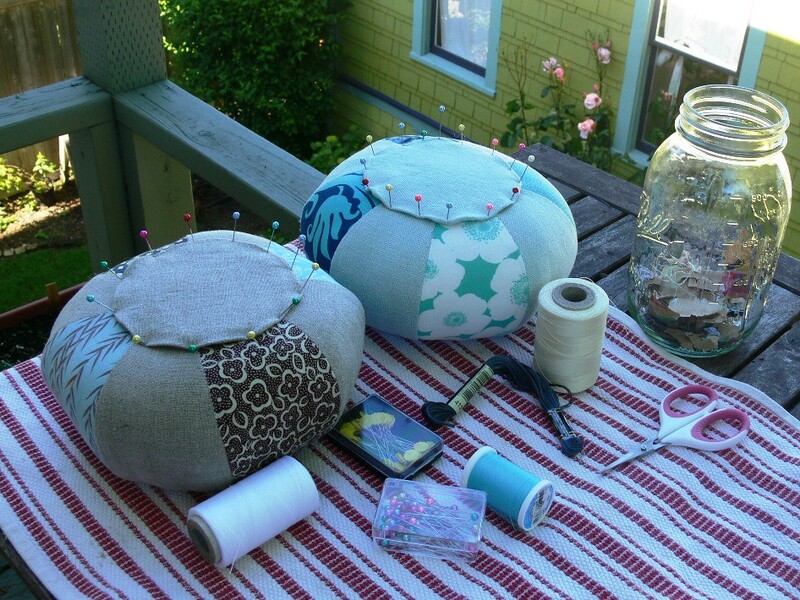 This also allowed me to work on them outside on pretty afternoons and to take 3 of the pincushions-in-progress with me on our trip to Austin and Nashville. I think I may have finished yours on the plane! 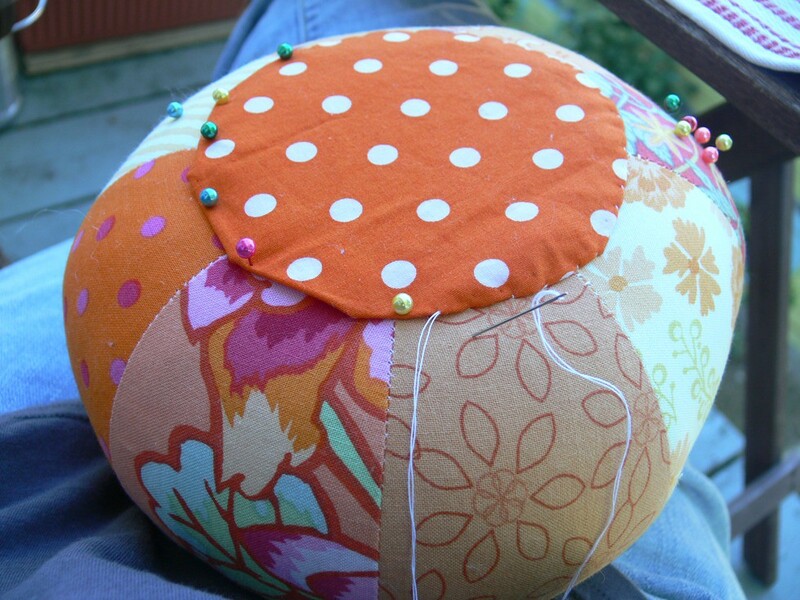 - I didn't measure my seam allowance correctly when sewing the sphere pieces and had to redo the assembly for all 4 caddies. Please be a measuring nazi here! Even when measuring exactly, you might still need to adjust a seam or two so that the edge of the sphere matches exactly with the tube circumference -- not the simplest thing. 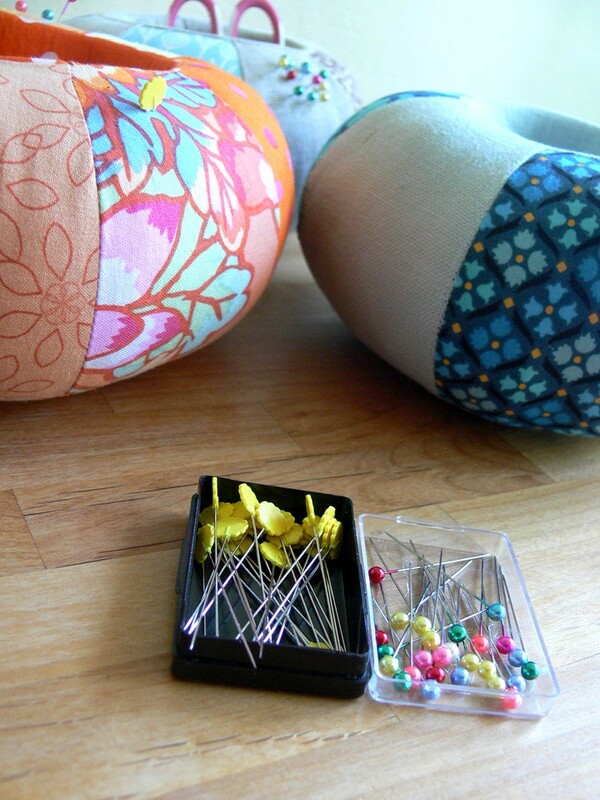 - Some of my pieces got pinched when sewing the sphere to the tube. 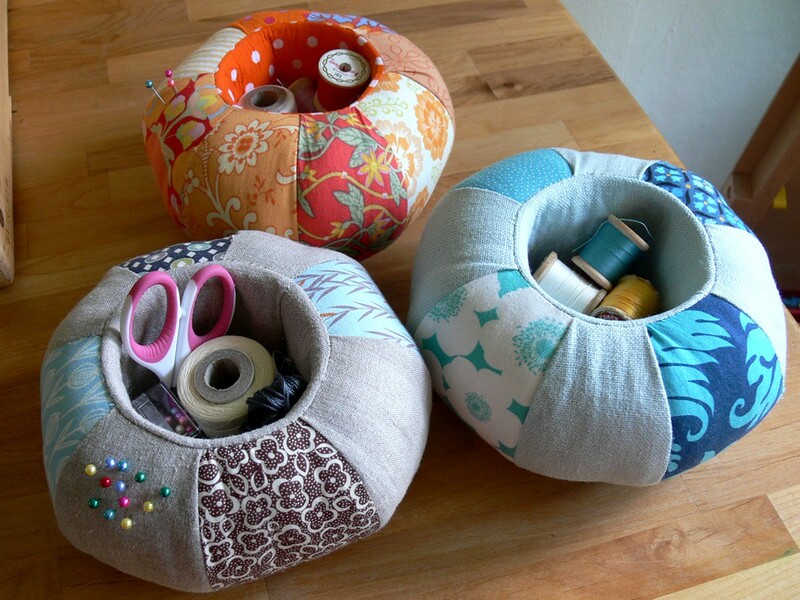 You can see the pleats created by that error on the top of the pincushions in some of the pictures. I should have been extra careful when flattening the two surfaces together and checking seams. 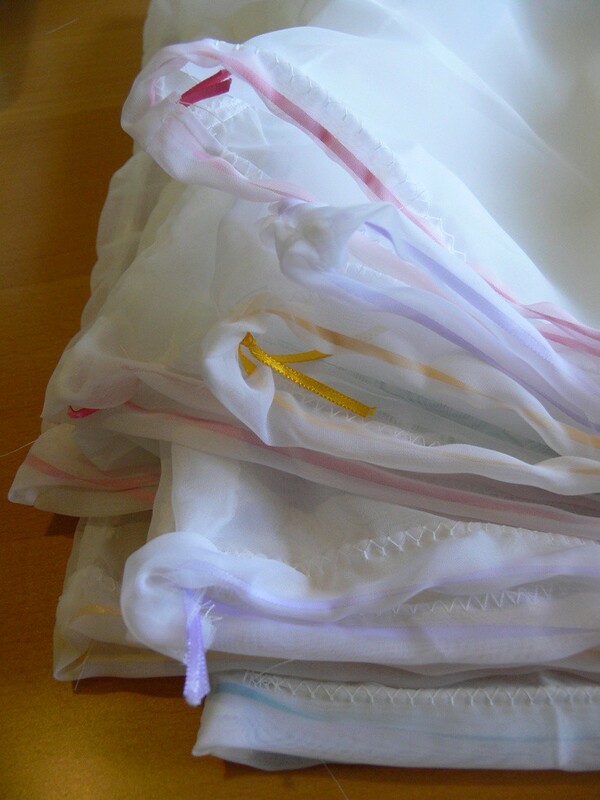 - The stuffing is very uneven in several of these, especially mine (which I used as prototype, with all first steps). Just make sure to push the first pieces of stuffing all the way around so that the part away from the opening is as thoroughly filled as the parts near the opening. - Despite holding the shape with a container and having used the heaviest duty interfacing for the tube, the inside isn't as smooth and straight as I would have liked. Not sure what I could have done differently. 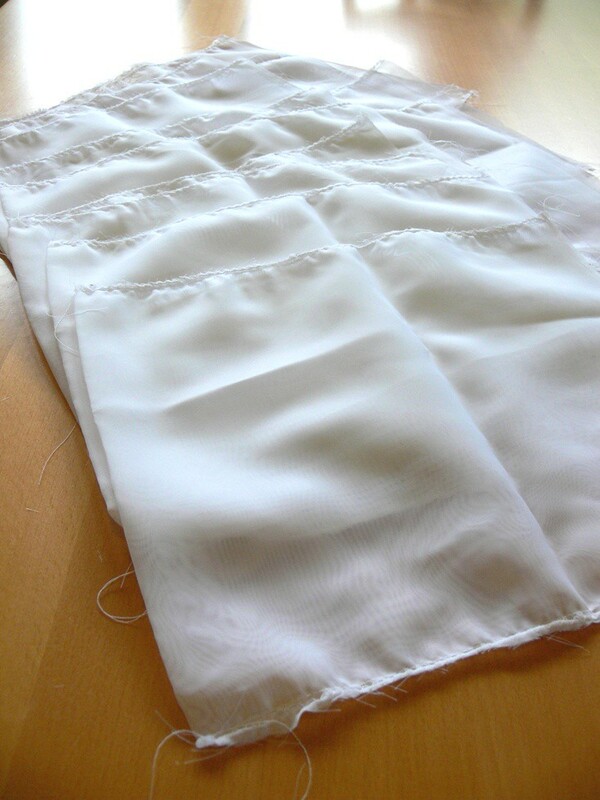 - Linen may not have been the best choice of fabric for this project, since once the caddy is stuffed, the filling tends to push the seams out quite a bit and some of my fabric unraveled in places. 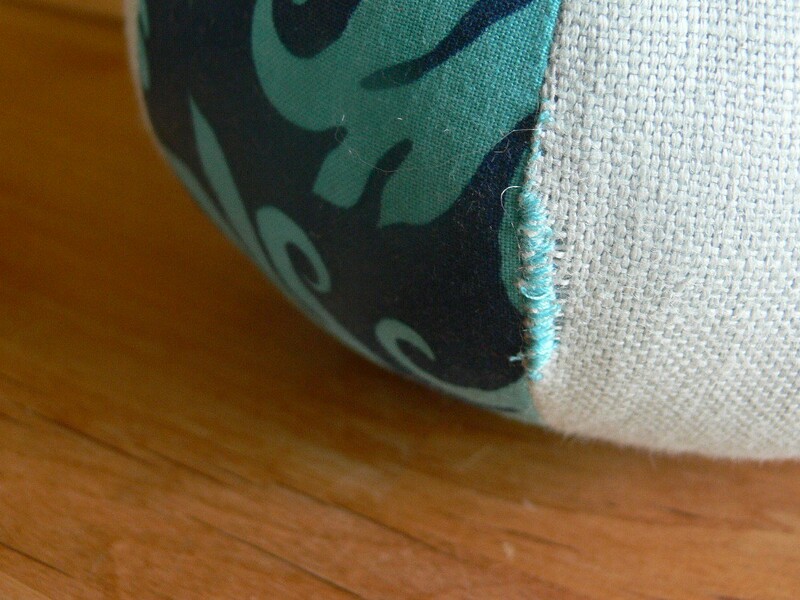 So, either double the stitching on the seam here, or don't use linen. I think that's about it. I hope this helps you or anyone else who might try to make this project! UPDATE: We're giving away this blue pincushion caddy along with Heather Ross fabric, gorgeous yarn and some vintage goodies starting July 12! Check it out here and leave us a comment (or a few!). The trip was great! Dollywood/Gatlinburg: Hot, crowded, expensive and exhausting. North Carolina mountains: relaxing, refreshing and beautiful. Ian loved the rides at Dollywood, and the people watching in Gatlinburg was STUNNING to say the least, so it all evened out. 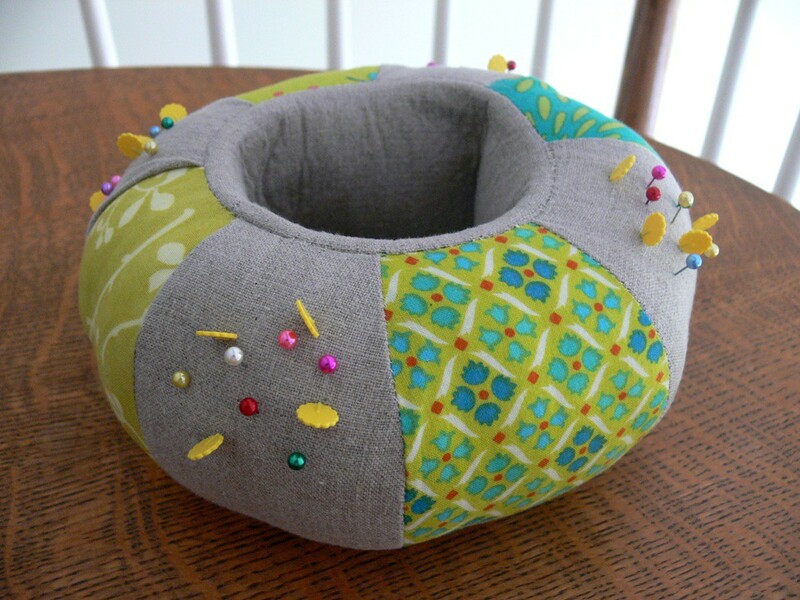 I absolutely love the pincushion you made me, and I have to wonder if you aren't being a bit hard on yourself over the "imperfections" you mention. When I look at mine I don't see anything but a thoughtfully made gift! I have to say that I am glad you made this for me, because anything that involves military precision in any form is just not my strong suit. Fusible interfacing can be a real nightmare, my last (and only) interaction with it involved a good deal of swearing and gnashing of teeth when I ruined a perfectly good piece of fabric because the interfacing got weird ridges in it. I have to admit that I love projects that use interfacing in theory, but I never end up making them because the whole process seems unappealing to me. 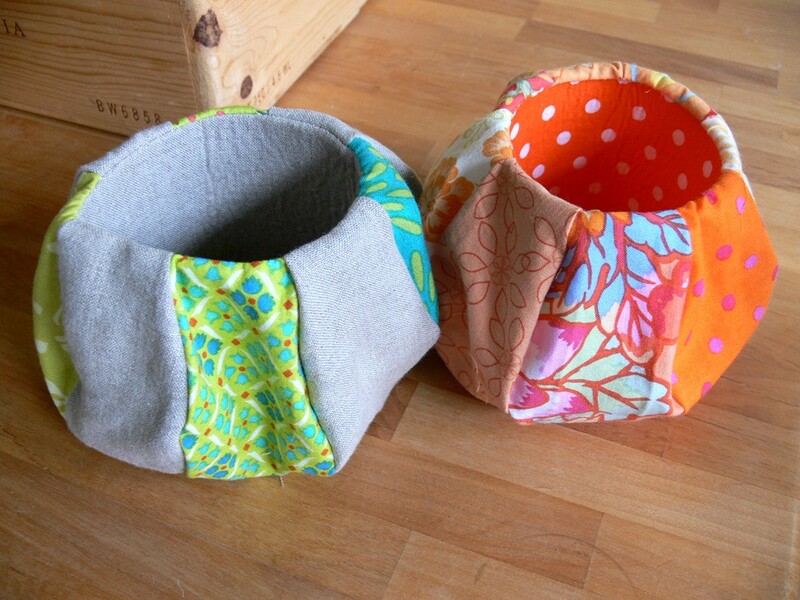 What I DO find appealing about this project, and in general, is the art of hand sewing. 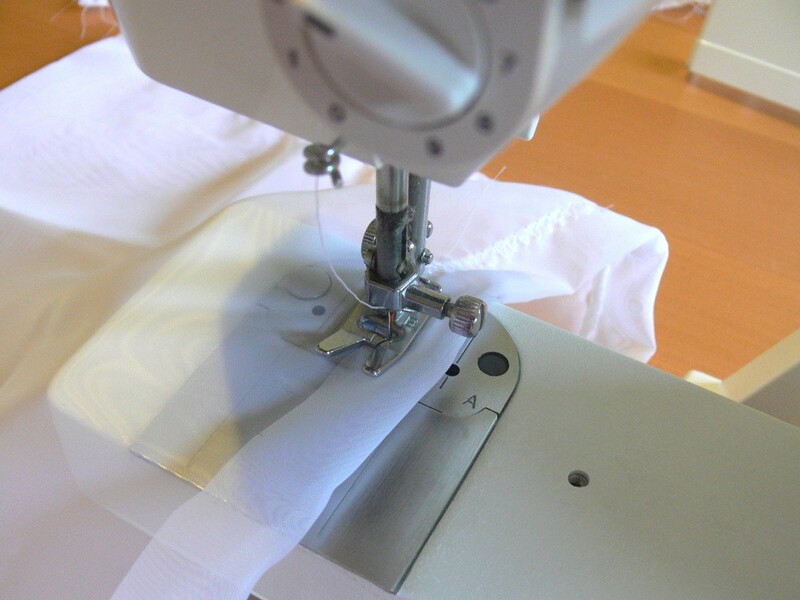 I would love to learn how to properly sew by hand (as opposed to the Frankenstein stitches I usually use to close things up at the end of a project). 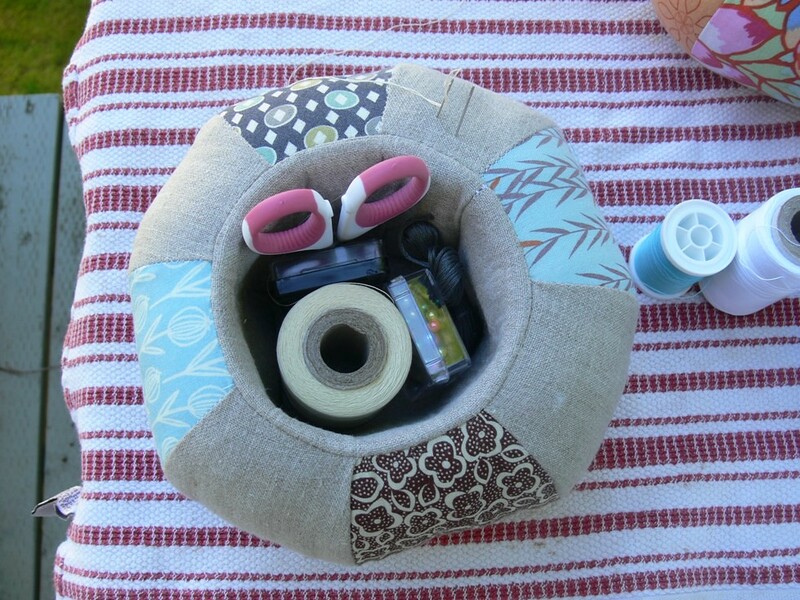 I wanted to bring some hand sewing with me on our trip so I could have handwork for the car ride, but after the packing, cleaning, cooking and other preparations I didn't get my supplies together in time! Do you have a favorite resource for learning the stitches? I've been drooling all over the book you gave me during my visit to Nashville, but since we've been talking about Anna Maria quite a bit around here, I figured I would wait a while before gushing some more! 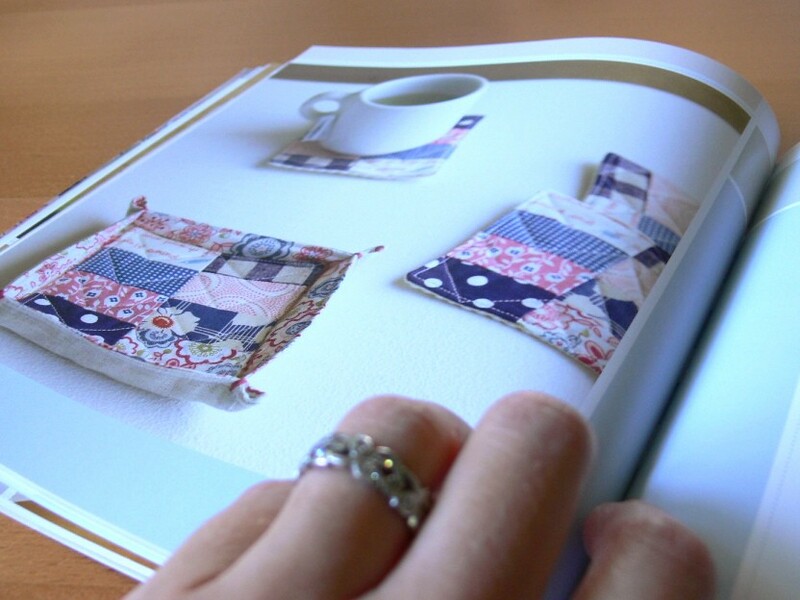 Instead, I thought I would focus today on another book that has quickly made its way into my heart: I Love Patchwork: 21 Irresistible Zakka Projects to Sew by Rashida Coleman Hale. After waiting for it for what seemed like forever from the library, I finally got an email last week that it was waiting for me at my local branch. Yippee! I had a feeling from seeing this book reviewed around the blogosphere a few months back that I might like it, and I was wrong: I LOVE it! 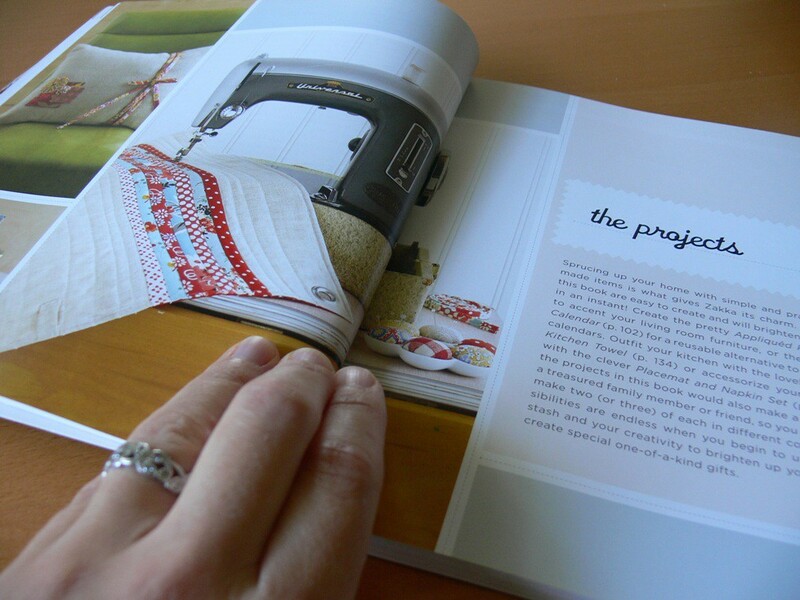 I love the simple but practical projects, I love the mix of cute colorful prints and natural linens, I love the clean layout and straightforward instructions. It is a great book! 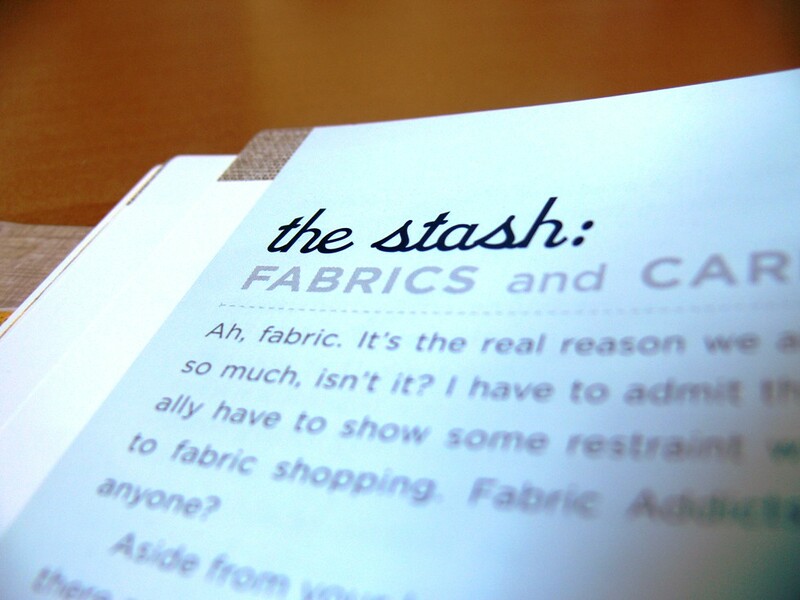 There are so many things I want to make in this book! 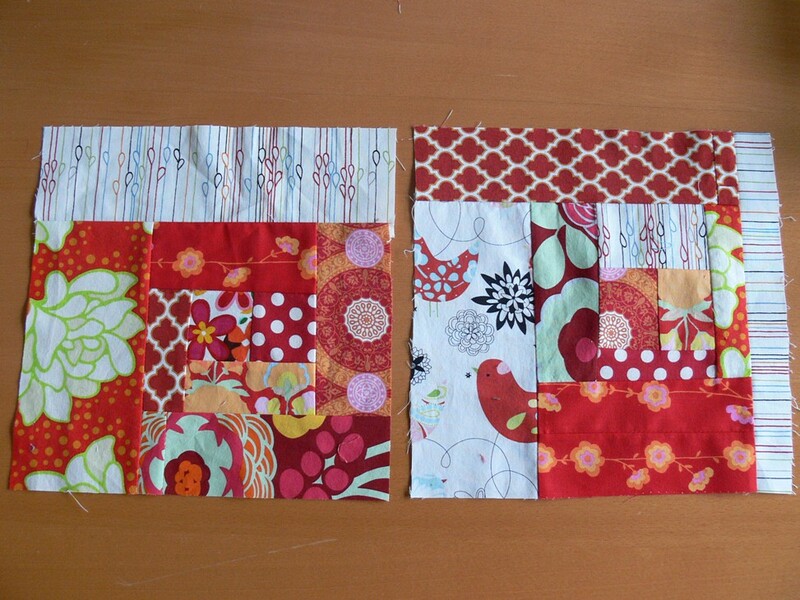 The patchwork bordered apron, the coaster set (a great housewarming gift! 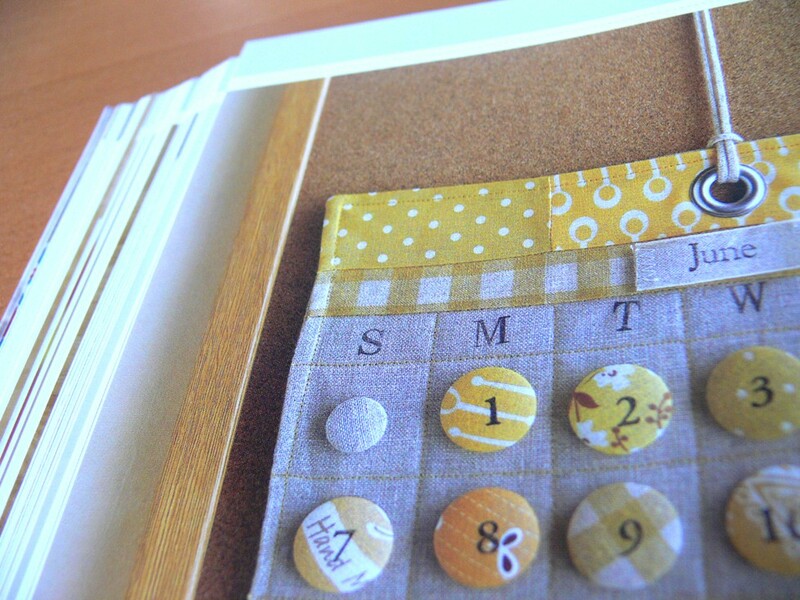 ), the fabulous button calendar, the sewing machine cover, the linen kitchen towels.... The list goes on. It's rare for me to like so many projects in a book. I highly recommend this book, especially if you want to learn some basic patchwork. 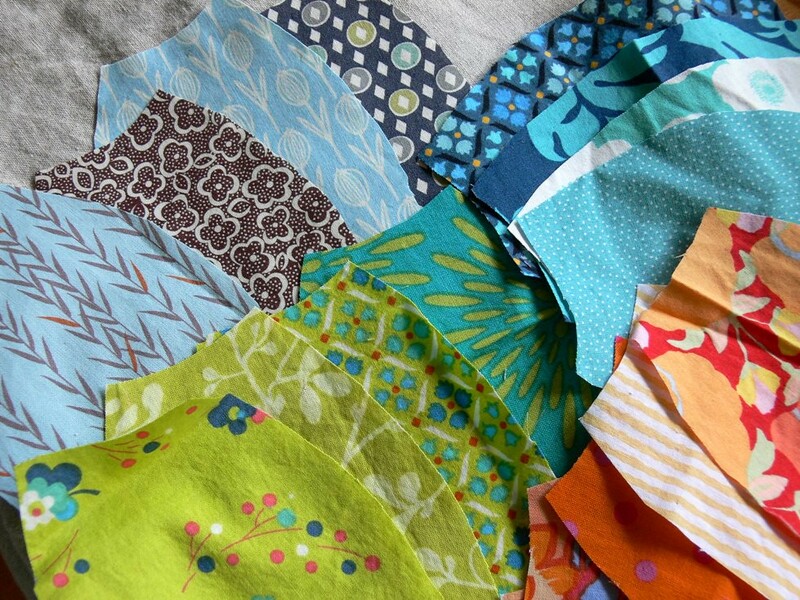 Rashida Coleman Hale also has a lovely blog, appropriately called I Heart Linen. 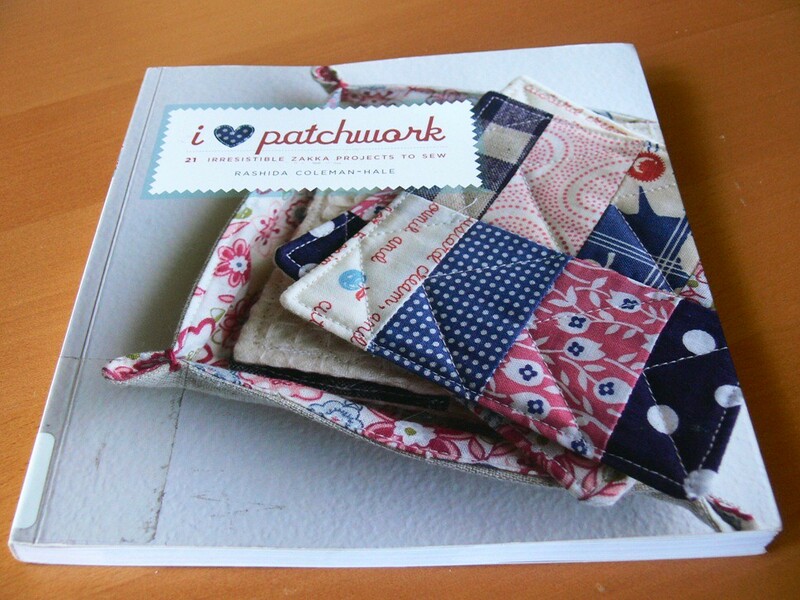 I am definitely putting I Love Patchwork on the "must buy" list and am now full of inspiration... and in search of yards of linen that won't break the bank! Jenny I will send good thrifting vibes your way! I found that huge piece of linen last year and still haven't used it all! It must have been 4 or 5 yards worth. I am not surprised to find that the Nashville Library does NOT have this book available. I might have to pull out all the stops and do an interlibrary loan for this one! You didn't mention what you are going to make first! It looks like the patterns really highlight all those cute Japanese fabrics that are so expensive you can only afford to buy 1/4 yard, I love it! Hello! Is it still World Cup FEVAH at your house? Have you ever heard this song by Air Miami? I dated an indie rock nerd in college and remembered this song from some "mix tape" he made me, and I thought of you, my poor World Cup Widow. This is one time I am glad we don't have cable. I followed the directions over at Lovely Design for this project. We used different papers for the letters instead of old artwork. Most of the paper we used was from a packet we bought from Sharilyn months ago! I am an ephemera nut and really love paper, so this was a fun project. I love the way it turned out! I've been trying to find projects that are a little more sophisticated as Ian gets older, things that he can help with that also look great hanging on the wall! We also made granola, I used a recipe from Cooking for the Whole Family by Cynthia Lair. Hey, here it is! Maple Nut Butter Granola. Hope things warm up for you soon! We're about ten degrees hotter than average here, which means mid to upper 90s! I wish the two extremes could meet somewhere in the middle for both of us! This project turned out so well!! What a lovely Father's Day gift! I like the idea of using pretty paper instead of painted artwork, smart. Yes, it still is World Cup Fever around this house... It's fun when it means we get together with friends to "watch" the games, but it's not so fun when we're stuck home all morning during a rare appearance of sunshine outside! My hubby likes to protest "but it's only once every 4 years!". Ugh. At least on Father's Day weekend, I kept my mouth shut and let him enjoy his soccer, he he. I also got him a nice local bottle of wine. Since he was off work and home for 3 full days, Ben and I didn't get around to making any crafts until Monday. We ended up getting the paints out and came up with something similar to what you did, except a lot less polished, with the letters cut and glued on top of a painted piece of cardstock, instead of peekaboo cut-outs. Do you ever have that sudden urge to finish a project that's been buried in your work-in-progress pile for weeks, or months, or even years? I had that bizarre impulse this weekend and am feeling strangely accomplished after completing this little project. A couple of years ago, I made reusable produce bags as part of a "green" gift for a friend of mine. When I cut the fabric for hers, I cut about 12 extra pieces for us. While I finished her gift on time, ours disappeared into the to-do pile to be forgotten forever -- until this past Sunday. I don't know if it's the farmer's markets popping up all over the place, or some weird get-it-done hormones from pregnancy (Oh yeah, I guess I haven't announced to our readers that I'm expecting baby #2... Hey guys, I'm pregnant! :-D) -- anyway, I just out of the blue remembered about these bags and decided that, while the husband was having a Father's Day veg-out afternoon in front of the TV and the kiddo still had about an hour to nap, it seemed like the perfect time to finish these! The bags are simple rectangle of sheer curtain fabric I got on super sale at Joann's or the like. I zig-zag sewed the edges together way back then, and that's about as far as I had gotten. The next step was creating the casing for the drawstring. With the bags wrong side out, I simply folded the top edge over about 3/4 inch and zig-zagged all around, back-stitching at the beginning and end, and leaving a 1-inch opening. I didn't even pin anything. My work was pretty sloppy, but this is one of those projects where it doesn't matter. The bags are for our personal use and will hold produce -- who cares? (I did do a much neater job on the bags I gave away as a gift!). 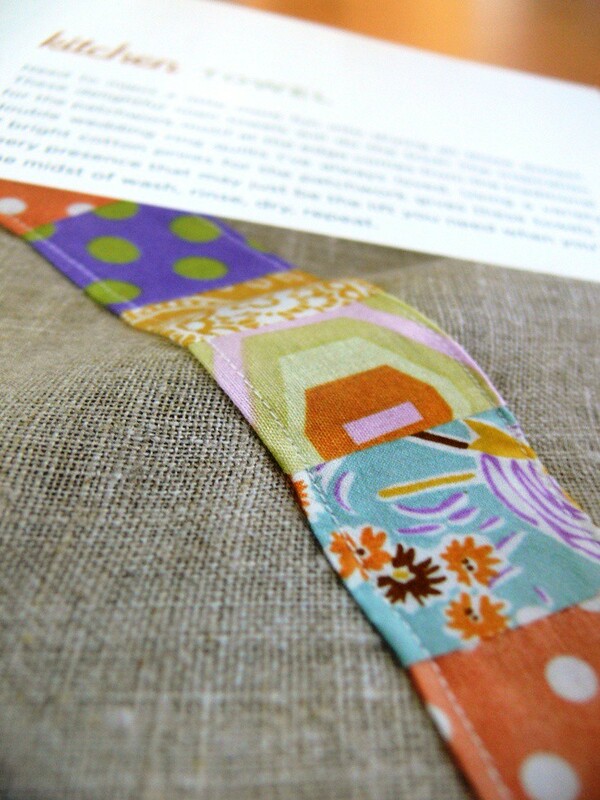 For my original gift, I had bought 1/8 inch ribbon in 4 bright colors, so I used that again. 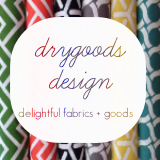 It is so lightweight and glides easily when opening and closing the bag with the drawstring. 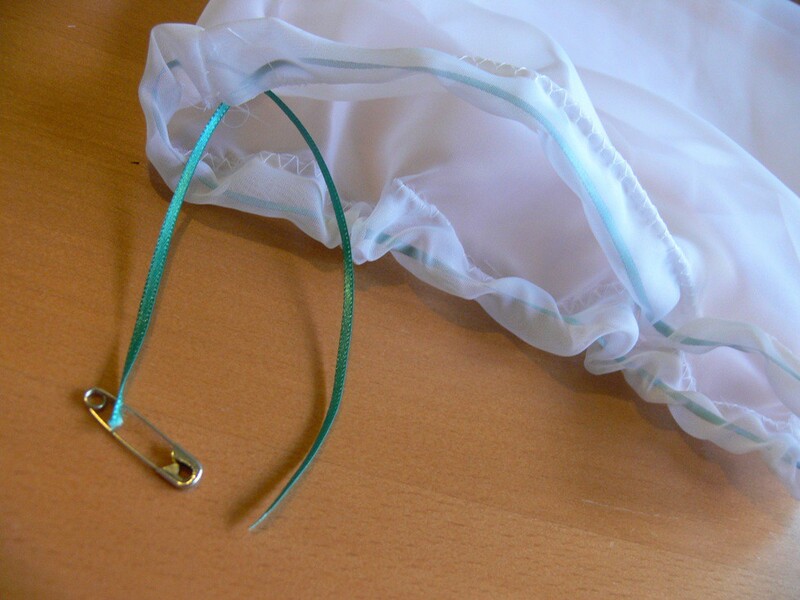 I simply hooked a safety pin to one side, and guided the ribbon through the casing. I tied the two ends into a knot. 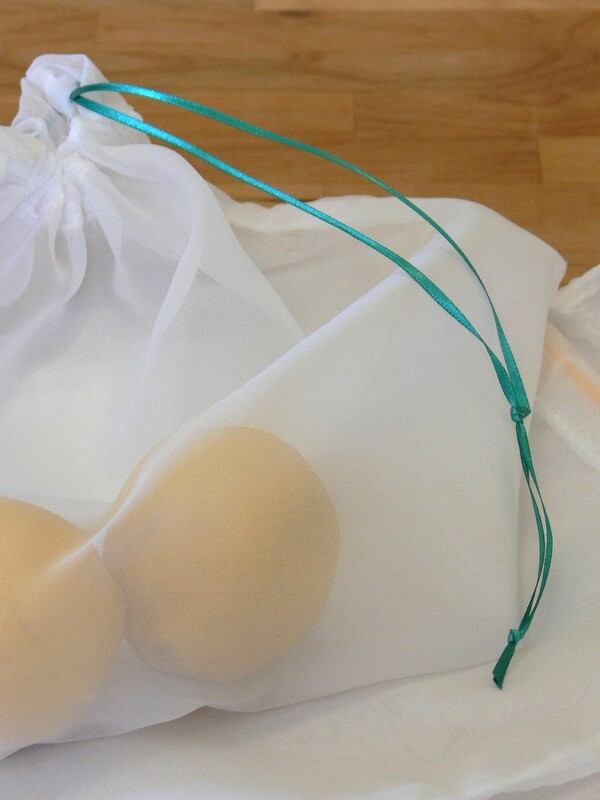 I was more thoughtful on my first go-round with this project and had tied 2 knots, which prevents the knot from hiding into the casing and makes it much easier to pull the drawstring. Finishing the project took about one hour. 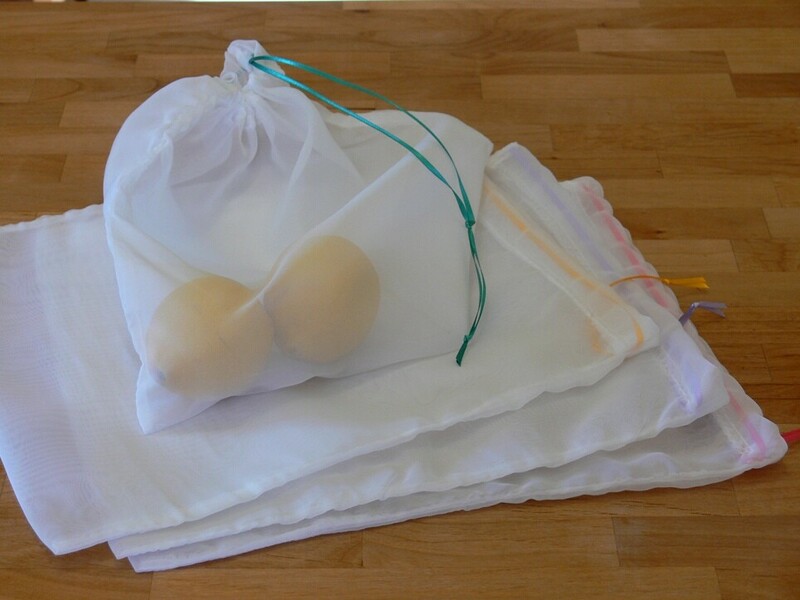 So total time for making a dozen produce bags should be about two hours: the perfect nap-time project, and the result is very practical and eco-friendly to boot! I am so psyched to have a nice little stash of produce bags to take to the market. No more loose fruit rolling out in the trunk of my car and plastic bags multiplying like bunnies in my kitchen! What did you work on this weekend? Any fun Father's Day activities or interesting projects? Way to go Jen! Those are super cool. 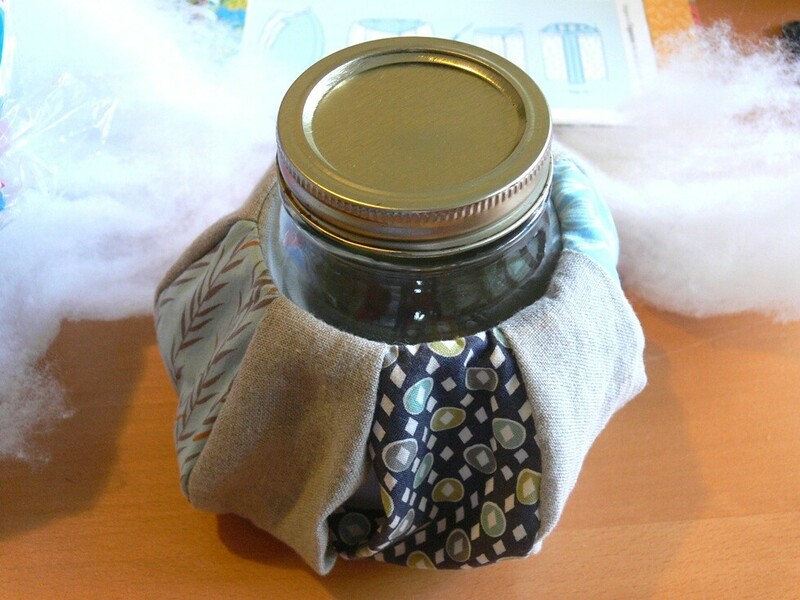 I want to make some of these as well, I've been taking in empty glass containers for the bulk items at the local grocery store, but bags like this would work much better! 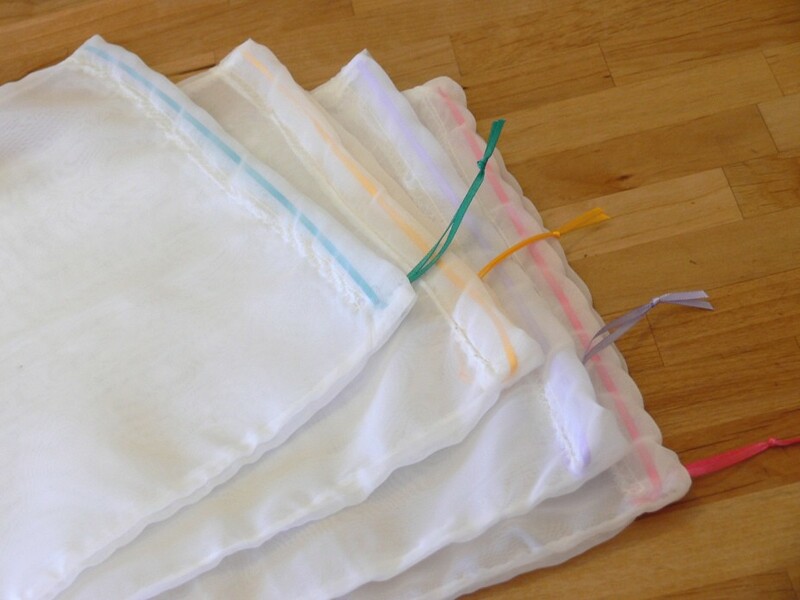 I have some muslin I've been thinking of using for bags like this, I wonder if it would be too heavy? I did work on something for Father's Day, I'll post a picture tomorrow! 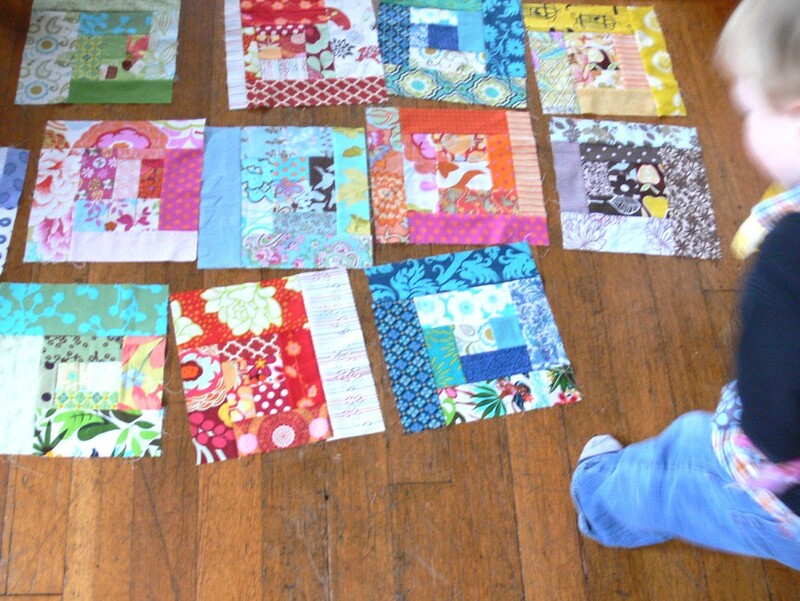 I have been a bit obsessed with quilts lately, trying to find inspiration for finishing my scrappy squares quilt and looking for ideas for baby gifts. So my links this week are, um, a bit quilt-centered (I did add a few non-quilt related links at the end!). 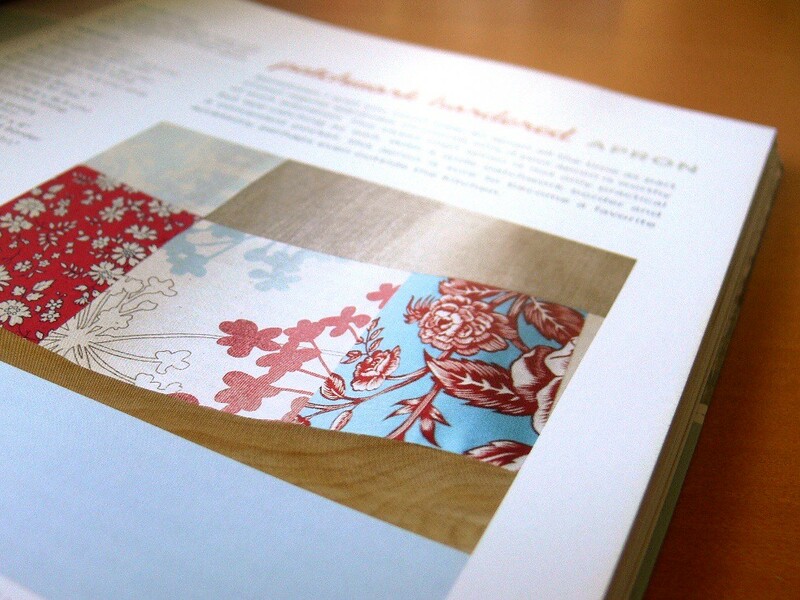 - Carly of Quiltville is just a wealth of inspiration in terms of how she pairs fabrics together. So many quilts, so many different looks. None of them look too complicated either. Here are a few: Dancing in Wonderland, Do You Dream in Color, Fun and Funky Oz, Poppy Dogwood Framed Patchwork and Summer Song. - I love this Fruit Stripe quilt by Crazy Mom Quilts, I think because it's so summery! 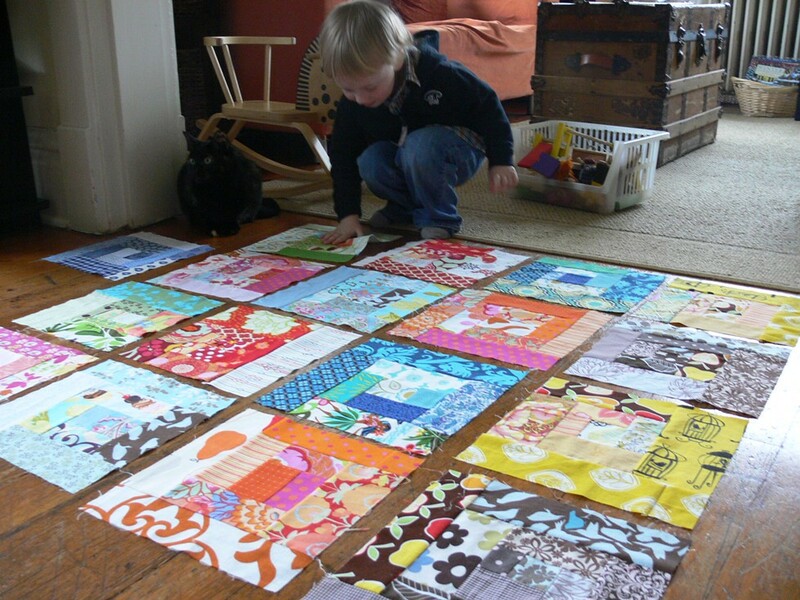 - I recently discovered the blog Cluck Cluck Sew through Fat Quarterly, and love these 2 coordinated quilts she made for her boys. The back of the twin bed quilt is featured at the bottom of this post. - And my favorite, Red Pepper Quilts, recently posted a few beautiful projects: an Organic Quilt, a crib quilt made from Anna Maria Horner's Little Folks voile (LOVE IT!) and another small quilt that is lovely in its simplicity. Okay, okay, enough with the quilts! Here are the other blog posts and projects I pinned this week. - Alisa Burke once again slays me with her creativity and productivity. Here she embellished a $7 striped Target tank with bold flowers she painted and appliqued with crazy stitching. 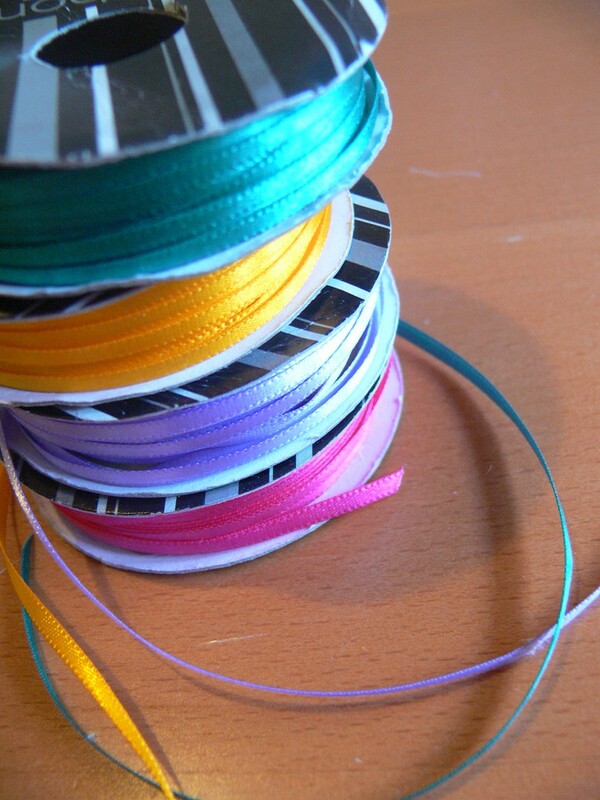 - I love this simple idea from Badskirt to stitch fun ribbon to colored webbing. I think I might have to make some belts for Ben! - And finally, I dig this decorative banner by Gennine, who of course, used all her own art. What fun stuff have you found this week? What are you (and our readers!) 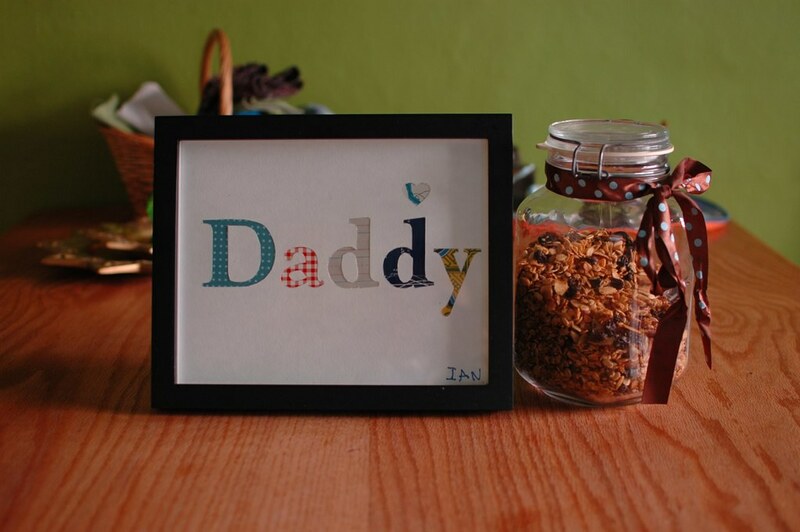 working on for Father's Day? That title sounds like I'm going to write about the adventures of a couple of misfit friends, doesn't it? Ha, sorry but no. Today, I want to share some progress I made on quilt blocks: more scrappy squares and my first block for the Rainbow Around the Block project. 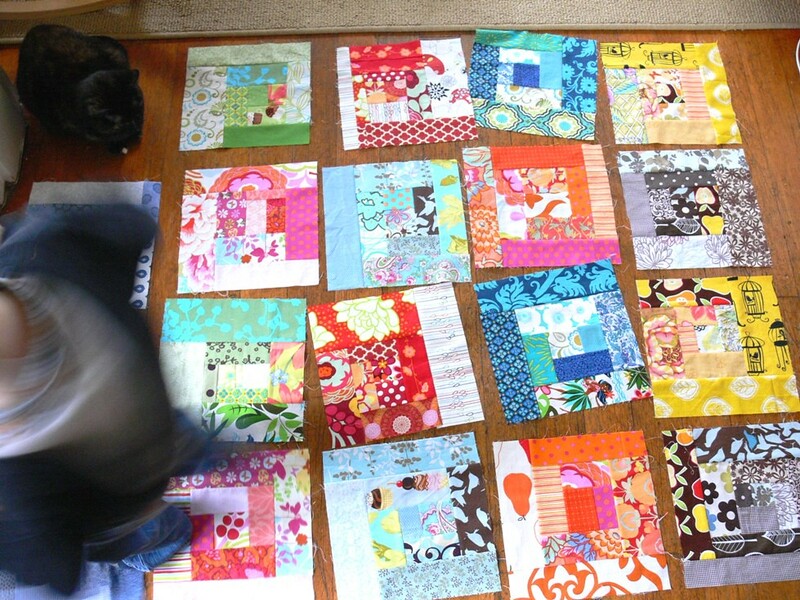 Over the past few months, whenever inspiration strikes and I find a moment of "free" time, I have been making more blocks to add to my scrappy quilt. The colors I still needed were brown, yellow, red and purple. I like the red ones, but I'm not too psyched about the yellow and brown. I think I should have been a bit more thoughtful about how to piece the busier vs mellower prints. Much to my dismay, I discovered that I had no purple scraps whatsoever! 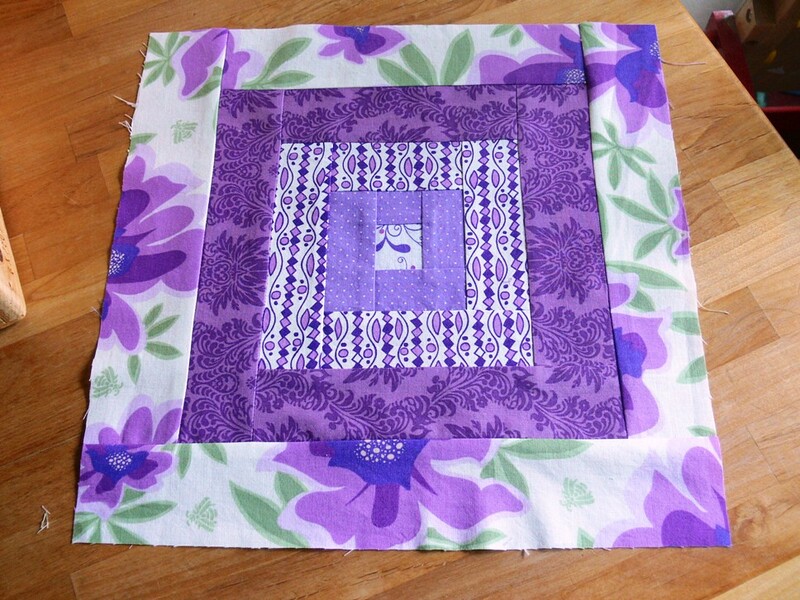 I found some periwinkle, some lilac, some fuchsia in the midst of other prints, but no purple that would stand out enough to establish the color of the block. Hmmm. 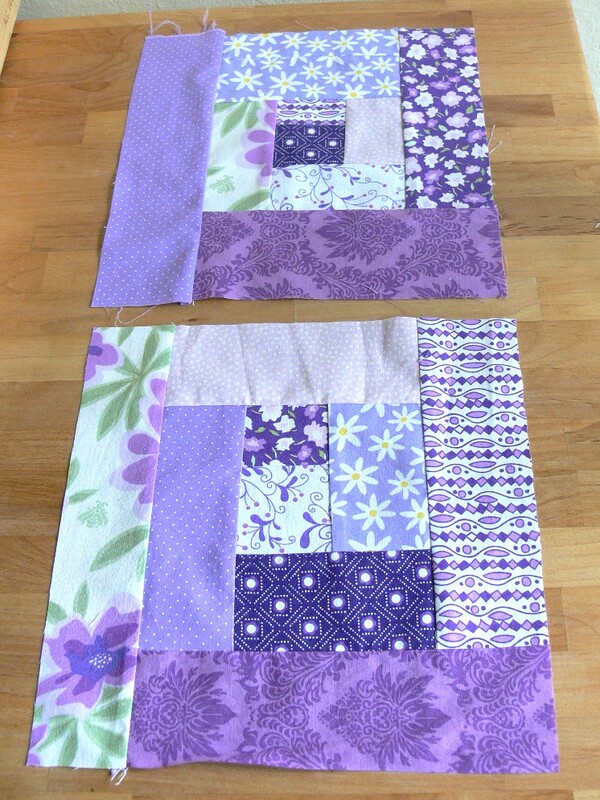 So here I was, missing 2 blocks in my big quilt master plan! Notice my two very helpful assistants! Sifting through my scrap box, I really couldn't find another color theme that hadn't already been used. 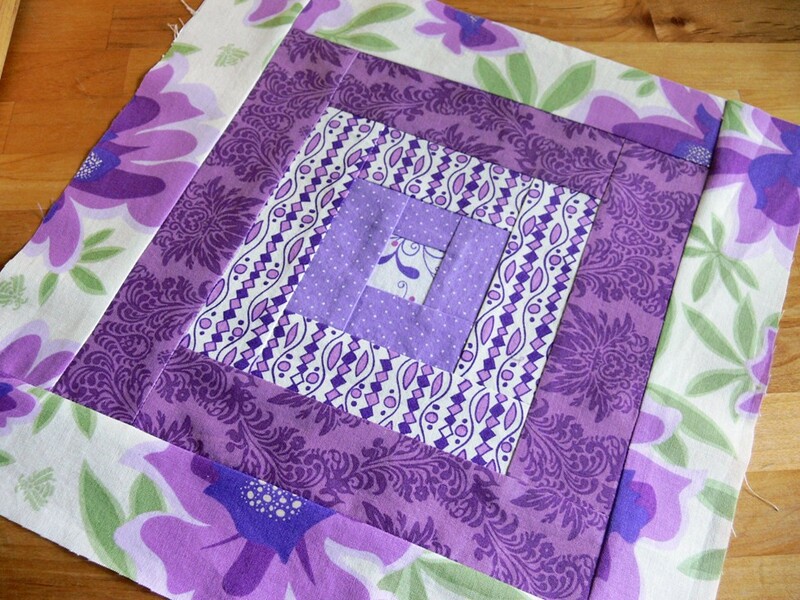 So, despite my 2010 resolution to stick to stash fabric AND the purpose of this quilt being to use up my scraps, I decided to purchase a few 1/8th yards and fat quarters of purple fabric. 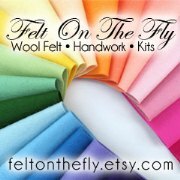 I figured they would come in handy anyway, filling a suddenly obvious gap in the rainbow of colors in my fabric stash. 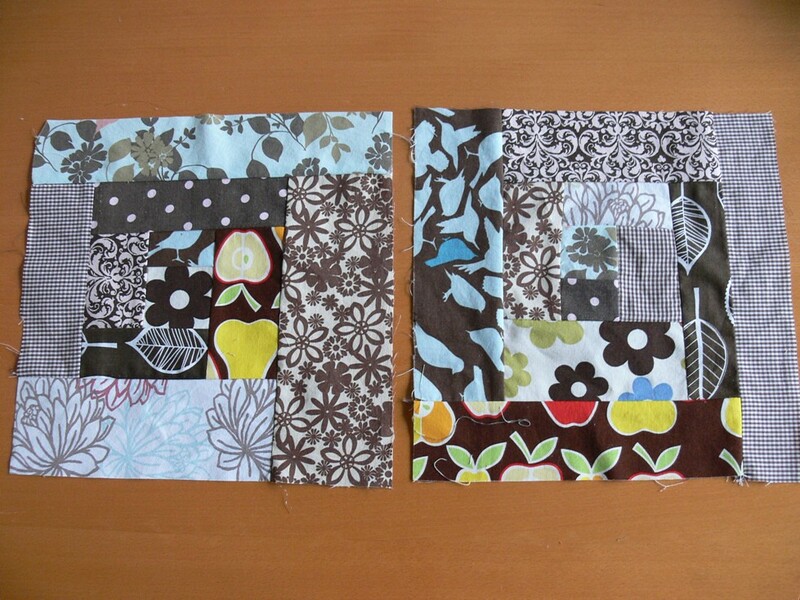 Here are the two last scrappy squares I made this weekend. I can't wait to lay them all out and decide on some kind of order and organization. I still haven't decided what kind of neutral fabric to use for sashing and border. I go back and forth between white, natural and grey. Kona cottons have so many options. I know I want a fun, funky print for the back and a bold binding. Both of those will be much easier to figure out than the stupid neutral!! Got any input for me? On to the other part of my progress this weekend... Since I had all the purple prints out on the table, I decided to tackle my first block for the Rainbow Around The Block project launched by the (hang on, bowing down in adoration...) amazing Anna Maria Horner. 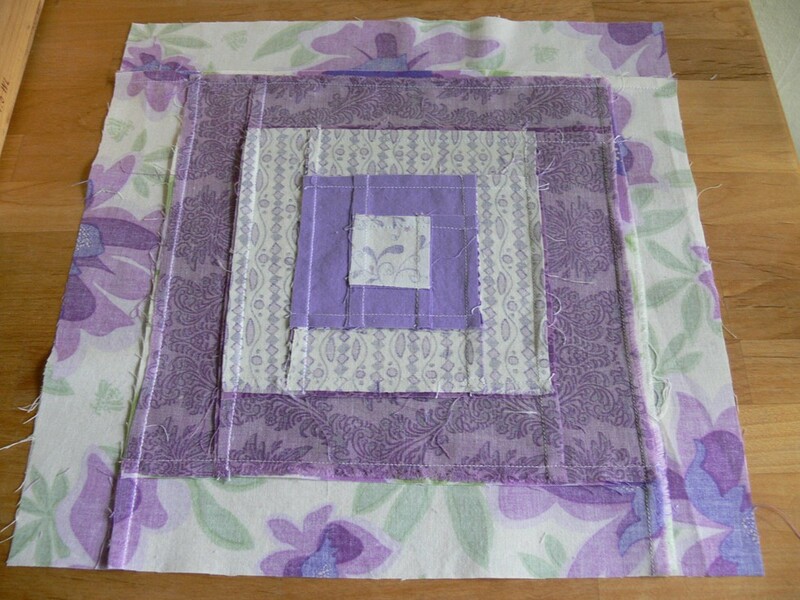 I don't know what this type of patchwork is called, but I have seen it many times while browsing quilting blogs and also in Denyse Schmidt's designs, for example. Is this another application of log cabin? It's basically a bunch of squares framing each other. Doing the math was a bit of a hassle, but shocker, I actually got it right! I drew a little sketch of my vision in my crafty notebook. The total measurements needed to be 12.5 x 12.5, and since my design was symmetrical, I figured out my dimensions by splitting the square in half. 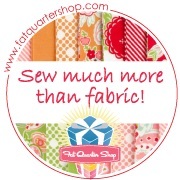 One half of the square is 6.25 inches. I counted 4 seams in that half a square. 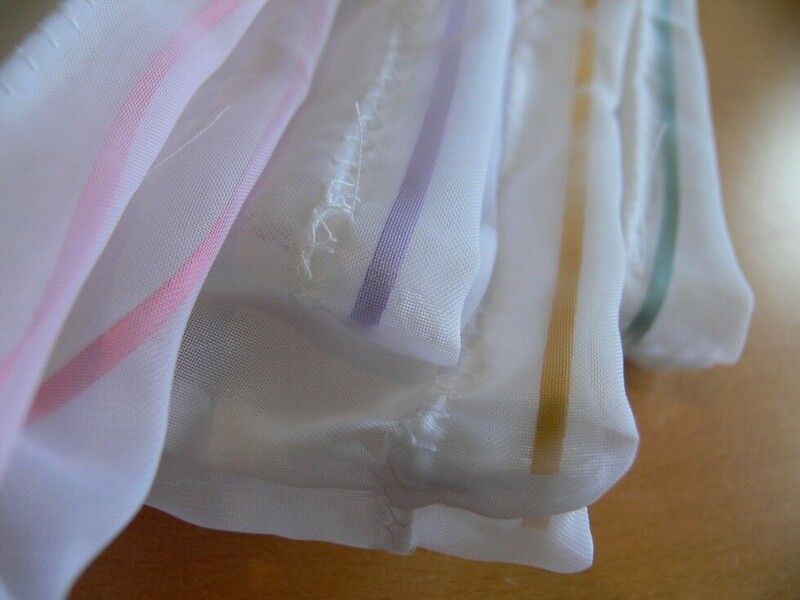 With a 1/4 inch allowance on each piece of fabric, that adds up to an additional 2 inches. 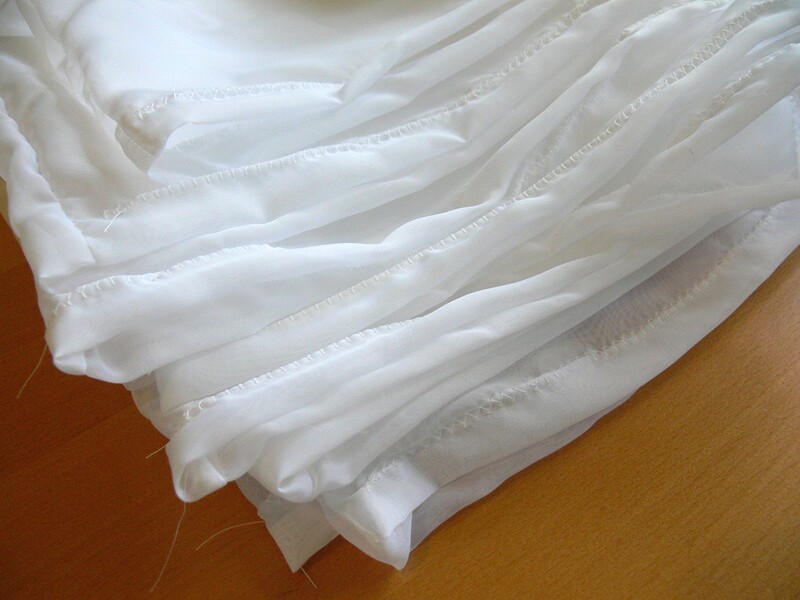 When including seam allowances, that meant each half needed to be 8.25 inches of fabric. From there, I played with how narrow or wide each layer should be and I ended up with numbers that worked: 1.5 inches for the center square (i.e. 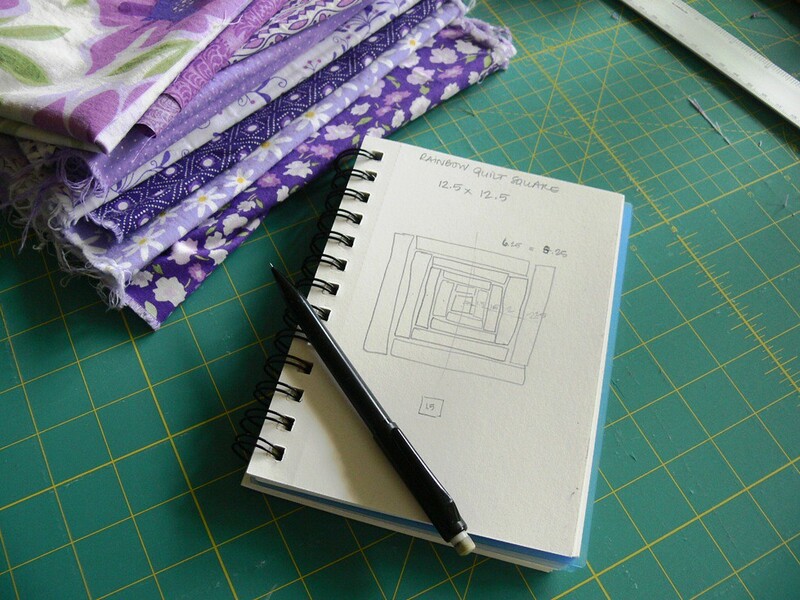 .75" for the half square), 1.5" for the next layer, followed by 1.75", 2" and 2.25". When sewing, I made sure my seam allowances were 1/4 inch, and I trimmed the square to correct accordingly, if needed, after each addition of a layer. Lo and behold, my final square was exactly 12.5 x 12.5 inches!! I am especially proud of the back: no messes and pinched allowances, yay! I'll be sure to post when I've made a few more. I'm going to shoot for 4 total. If I can get more done, great -- and I shall try. But I think 4 is a reasonable goal and contribution, considering the pile of gifts and household items I have to make in the very near future and the upcoming plans and visits for the summer. Have you decided what color you're starting with? 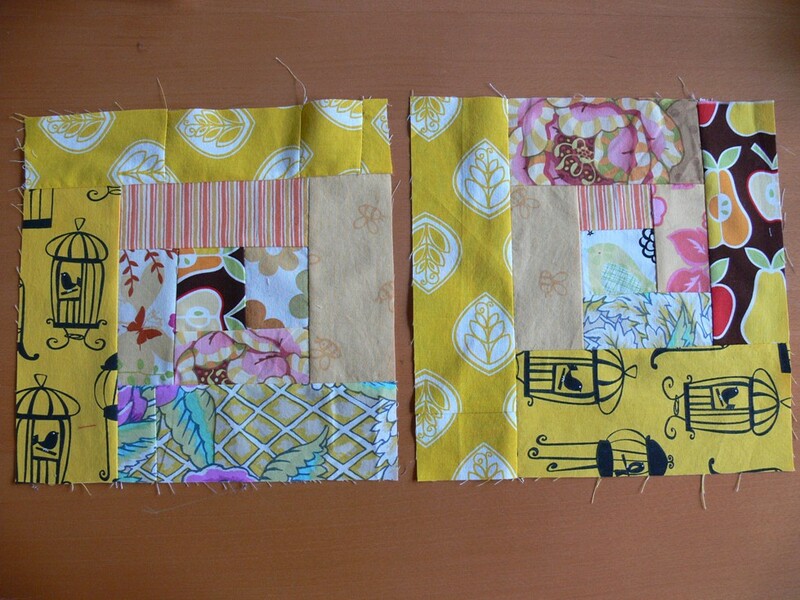 What patchwork style are you going with, I think you mentioned wonky log cabin? Can't wait to see what you come up with!! Your squares are REALLY coming along! The purple square for the Rainbow project is beautiful. I pulled out my fabric yesterday, and my scrap bag must be quite paltry compared to what you're working with! 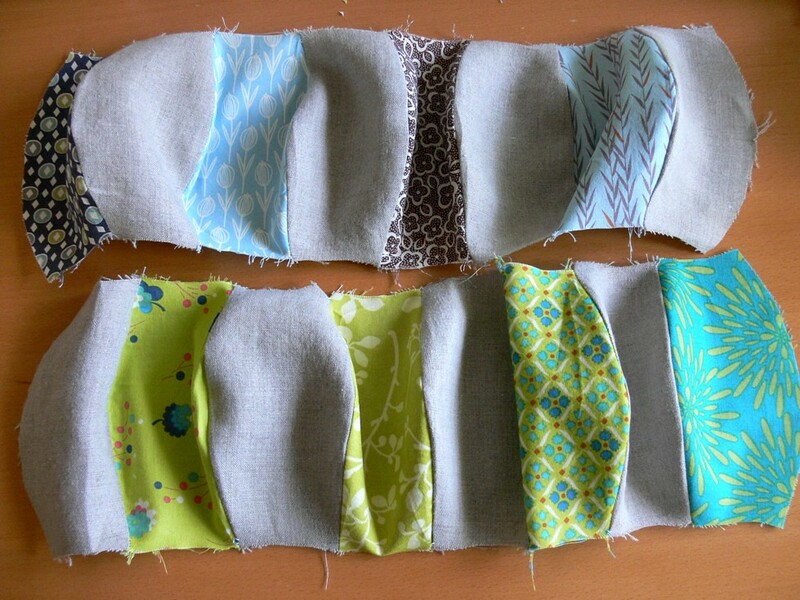 I did start making piles of fabrics that would work together, and I plan to use your example above for the first one at least until I get my bearings! Oh yeah, it's Link Love Friday! Show and Tell: Good Friends! Project Craft Room Organization: Getting Better!